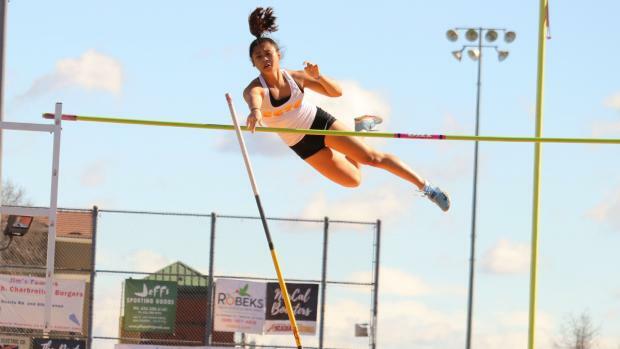 Laurel Wong, the defending CIF State Meet champion in the pole vault, won the CA Winter Championships title for the third year in a row. She did it on her final attempt at 12-10, the height the eliminated the remaining jumpers in the field. The Stanford-bound Wong than took three attempts at at meet record and PR of 13-05, coming closest on her second attempt. The stacked girls pole vault field in what will be one of the deepest of all the events in the state this spring, saw Westlake sophomore Paige Sommers place second, Poway senior Camryn Thomson place third, followed by Clovis West senior Elizabeth Funk and Redondo Union senior Amari Turner. Great Oak junior Kaitlyn Swenson tied for eighth picking up half a point for the Wolfpack. 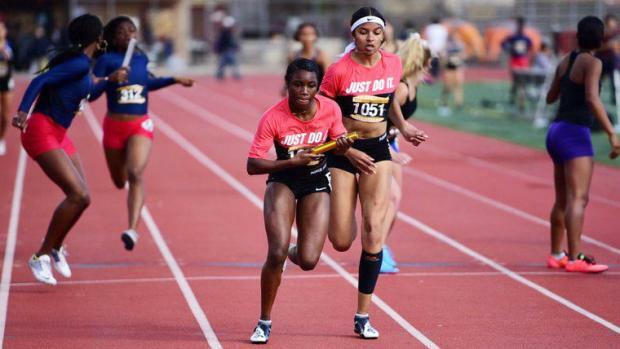 The loaded Calabasas girls 100-100-200-400 sprint medley relay of Kennedy Waite, Jade McDonald, Bella Witt and De'Anna Nowling rolled to a meet record time of 1:44.28, which is also U.S. No. 1. McDonald, a sophomore transfer from Mater Dei (SS) who is primarily a jumper and hurdler, had to shift into the lineup in place of senior standout Kyla Robinson-Hubbard, who was unable to compete because of a scholastic testing obligation. No worries. Coach Jeff Clanagan moved Witt from the second leg to the third, inserted McDonald into the second leg where she and Kennedy executed what they described as a seamless handoff. Nowling, the returning State Meet champion in the 100 meters, is nonetheless an accomplished quarter-miler, an event she enjoys. She said of Witt's 200 leg, "she ate that up" and then proceeded to do a little eating of her own. Nowling showed as she ripped through a 55.3 anchor split as the Coyotes were unchallenged by runner-up Dana Hills, some four-plus seconds back in 1:48.33, but also under the previous meet standard. St. Mary's Academy (1:48.68) and Leuzinger (1:49.88) also went under the previous meet record. "It is my favorite race," Nowling said. "I already have a title in the 100. It only makes sense to go get a State title in the four. 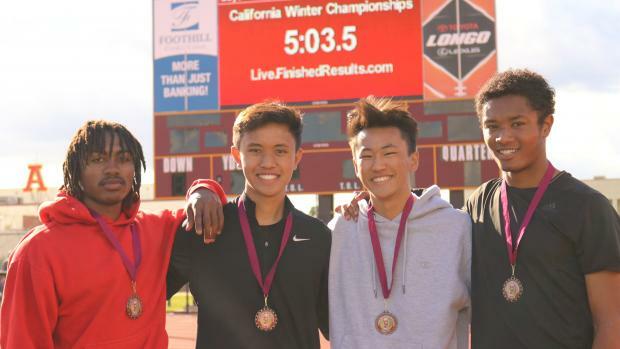 I might be switching events ... "
Valencia (SS) senior Kai Wingo had himself a day, winning the 600 (1:19.80) and then he came back to anchor the winning sprint medley relay team, running the 400 in the 100-100-200-400 race (1:33.57). In the open 600, West Ranch junior Solomon Strader was knocked off stride temporarily with about 350 to go and ended up second 1:20.98. Another Foothill League middle distance standout, Antonio Abrego, a sophomore at Golden Valley, was right on Strader's heels at the finish, crossing in 1:21.05. Seeing Abrego and Strader ahead of him after getting boxed in early, was the inspiration Wingo said he needed to pull out the victory, saying to himself during the race, "I'm not going to lose to them today," he said. "So I started speeding up and caught them." In the SMR, Wingo admitted that it was his fault the team didn't win last year and is not now on a three-year winning streak. He said he was determined to make amends this time and needed to hold off a strong team from Cathedral (SS) to do it. Valencia crossed in 1:33.57, less than a second in front of Cathedral (1:34.51). Selma senior DeAndra McDaniel, one of the state's elite horizontal jumpers, swept the long jump and the triple jump. He went 21-06.75 to win the long jump and 45-07.50 to win the triple. He joined Gaitan as the meet's only athletes to win two individual events. Meet timers, Finished Results, needed to take a long look at the finish line photo before determining the winning order of the boys 60 meter dash. 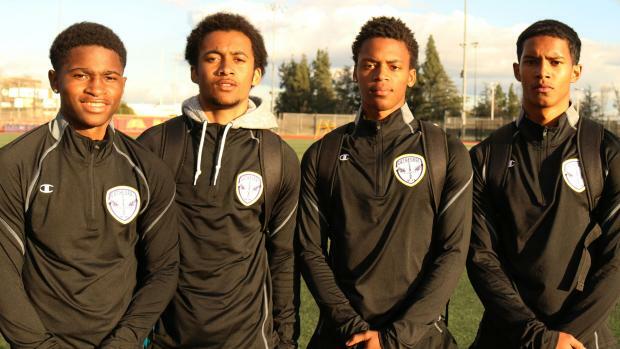 An elite field that should take us through the spring all the way to the State finals ended this way for 60 meters: Kenan Christon (Madison/SD) 6.984, Christopher Hill (Rancho Cucamonga/SS) 6.990, Cristian Moore (Oaks Christian/SS) 6.995), Tylyn Cook (Valencia/SS) 7.000 and Kamari Maddox (Elsinore/SS) 7.02. Christon's mark is the fastest winning time in the event since 2016. Moore ran 6.94 as the fastest time in prelims. 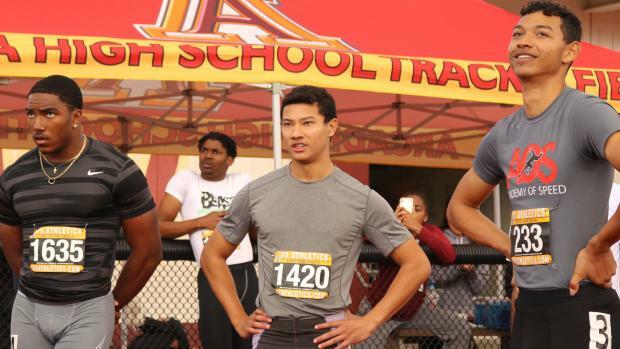 Christon, a football running back who signed to play at USC, is the only returning sprinter in CA to have won medals in both the 100 and 200 at last year's State final. Hill and Moore both had their junior seasons cut short by injury. Hill would later win the 300 (34.12) holding off Maranatha senior Brendan Fong (34.54). Jazmyne Frost, a senior who will be Christon's track teammate next year at USC, won the 60m in 7.59 (-0.6). 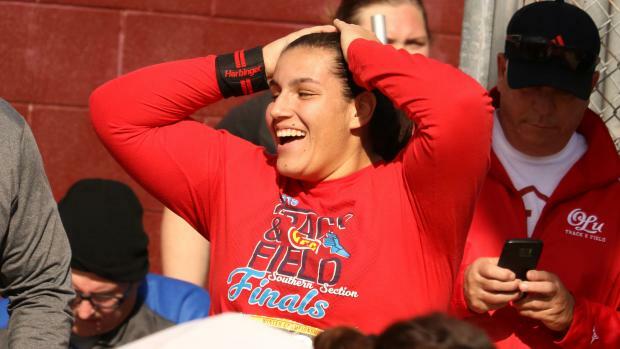 Frost is one of the few holdovers with the Gardena Serra program that won the State girls team title last year. Frost accounted big points in the sprints and the relays last June. She said Saturday's victory was a tune-up for next week's Simplot Games indoor meet in Idaho. Witt, a sophomore transfer from Birmingham Charter (LA) where she won the LA City Section 100m hurdles title as a freshman, won the girls 60m hurdles (8.69) with Serra senior A'lena Chaney second (8.88), Norco junior Taylor Shorter third (8.94) and Bakersfield Liberty sophomore Reese Renz fourth (9.01). Merrill West senior Warren Williams, one of the state's elite hurdlers, took the 60m hurdles in 8.24 with Peninsula junior Aiden Lieb second in 8.27. Warren sophomore Dayanara Cendejas won the girls weight throw with a best of 48-04.75. Bakersfield Liberty sophomore Faith Bender was second. Bender also got second in the shot put, losing the gold on the final throw by West Ranch senior Natalie Ramirez. The UCLA-bound Ramirez popped a big PR of 47-00 to pull out the victory. Ramirez's throw is the third longest in the U.S. this winter. Morro Bay junior Joseph Ruddell cleared 6-05 to win the boys high jump. Canyon Country Canyon junior Tyler Cash also went 6-05 but Ruddell took the title by jumping clean all the way to the 6-07 elimination height while Cash had multiple misses along the way. Corona junior Egbe Ndip-Agbor held off a surging field to win the girls 300 in 39.56. Lakewood senior Alexus Alexander was second in 40.18 with St. Bernard senior Sydney Bentley (40.30) and Norco junior Taylor Shorter (40.37) right behind. The girls 4x200 was an all-Inland Empire affair with Orange Vista winning (1:42.80), Roosevelt was second (1:42.94) and Corona, with Ndip-Agbor on anchor, was third (1:44.23). In the girls 3000, it was hardly a walk in the park for Gaitan, whose most recent high-level competition was as the top-finishing California girl at Nike Cross Nationals at the start of December. In a race that didn't have a senior among the top five finishers, Gaitan used a last-lap kick to create separation to cross in 10:07.11 with Skyline (OK) junior Eleanor Wikstrom second (10:11.96), Costa Mesa junior Diane Molina next in 10:14.79, Granada Hills (LA) freshman Sofia Abrego in fourth (10:21.40) and La Canada freshman Ellaney Matarese fifth in 10:30.54. Cathedral continued its dominance in the boys 4x200 as a warm-up for next week's trip to the Simplot Games in Idaho. The team of Mikal Gammage, Anthony Taylor, Lennard Marshall, Elijah Islam crossed in 1:30.65 ahead of runner-up Pitman (1:31.99). Janiah Brown, a senior at Oaks Christian, wasn't even seeded in the "fastest" of the three heats of the girls 600. No matter, Brown, a transfer from Calabasas, made it the fastest heat, running 1:35.42 to win the title. Roosevelt senior Alexys Ford, running in the third heat, went 1:36.12 for second. Four girls cleared 5-1 in the high jump with sophomore Maia Garcia (Santa Clara) declared the winner. Cabrillo senior Ty Hernandez won the pentathlon with 3,012 points. Redondo Union senior Hunter Bode was second with 2,931 points. Orange Vista senior Skye Lattimore won the girls pentathlon with 2,784 points with Stockton Lincoln senior Yasmyn Harris second with 2,729 points.